Two months after posting their worst confidence reading of 2011, home builders say they foresee no improvement in the immediate- or medium-term market for new homes nationwide. In August, for the second straight month, the Housing Market Index read 15. 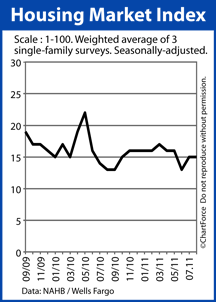 The HMI is a monthly housing survey, published by the National Association of Homebuilders. It’s scored on a scale of 1-100 with readings over 50 suggesting favorable home builder conditions. Readings under 50 suggest unfavorable conditions. The Housing Market Index has been below the 50-point benchmark since 2006. To calculate the HMI, home builders are asked 3 separate questions, each addressing the different element of the new home sales business. How are today’s market conditions for the sale of new homes? How do you expect market conditions to be 6 months from now? How are the current foot traffic of prospective buyers? Based on the August answers to these questions, builders are witnessing an improvement with the current market, partially fueled by low mortgage rates, but expect momentum to fade into early-2012. As a home buyer , this may bode well for you. If you can wait to buy a home, you may find builders more willing to concede on price or upgrades. The other side of that conversation, though, is that while you may save money on the home, you may lose it in your monthly payments. Rising mortgage rates can quickly zap your savings — adding tens of thousands in interest costs to your budget long-term. For now, home prices remain low and mortgage rates do, too. Home affordability is at an all-time high. Take advantage of what the market gives you.